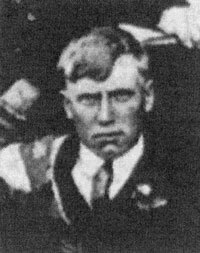 Robert Averell was born on 24 March 1890 at Magherafelt, County Londonderry, son of farrier Robert Averell and his wife Louisa (nee Cummins). A chauffeur and groom, he enlisted in the North Irish Horse at Magherafelt on 11 March 1910 (No.485). Trooper Robert Averall, of the North Irish Horse, writing to Mr. John G. Gamble, of Magherafelt, in 2nd inst., says – "We are having a badly needed rest just now, as our horses were nearly played out. Cavalry is not much use in the trenches, but we hope to get plenty of work when the Germans get on the move again, and I hope the next halt will be in Berlin. It is hardly likely we will be home for Christmas, but I hope we will be there for the 'Twelfth!' Four Cookstown fellows are here in my troop – Sergeant Ashcroft, Corporal Espie, Lance-Corporal Henry, and Trooper Willie Crooks. We are visited by the enemy's aeroplanes almost every day. They fly over our lines and drop bombs all over the place but do not do much damage, and we usually manage to bring them down in the end. We were on guard during the King's visit, and were on the look out for spies. We succeeded in capturing two disguised as shepherds. They had some sheep and a dog. We are getting tired of mutton chops, so we will perhaps try dog-flesh for a change!! Remember me to all the comrades in the U.V.F., and tell them I am hoping to rejoin their ranks soon. A German helmet has been sent by Trooper Robert Averall, of the North Irish Horse, to Mr. Gamble, Magherafelt. The helmet evidently belonged to a cavalry man, probably one of the huzzars, and is in good condition. It gives evidence of having been at the war as there is a bullet hole on the right side. It is at present on exhibition in Mr. Gamble's grocery establishment. Dear Sir, – We would respectfully draw your attention to a statement which appeared in a recent issue of your paper, just come to hand, namely, that Troopers S. Espie and G. Henry were home on leave from the Squadron of North Irish Horse (A) acting as bodyguard to Sir John French at General Headquarters. The above-mentioned are corporals and belong to C Squadron, which as been acting as Divisional Cavalry since coming to France on August 22nd, 1914, with the exception of a few months last winter, when the squadron was broke up to work with different Corps Headquarters. Owing to absence of real cavalry work, the chief work of the Squadron has been in the nature of pioneer work, viz., trench digging, barb-wiring, and sand-bagging redoubts, etc., and on several occasions the wiring has been done outside the front line parapets, not fifty yards from the German trenches; also carrying wounded from trenches to advanced dressing stations; escorting German prisoners to nearest rail-head from reserve line, and taking their turn in the trenches as infantry when required. In fact this Squadron has not been out of the firing line (proper) since they came out, and a good many of our comrades out here have rather resented the statement, that has so often erroneously appeared in your valuable paper, that the Squadron was on Headquarters work. R. Averall, 485; H. Bradley, 968; Corporal S. Brown, 583. In June 1916 C Squadron joined with F Squadron and the 6th (Inniskilling) Dragoons Service Squadron to form the 2nd North Irish Horse Regiment, serving as corps cavalry to X Corps until August 1917. On 15 August 1917 Averell was disciplined for "creating a disturbance in his billet about 11.30 PM". The following month the regiment was dismounted and absorbed into the 9th Battalion, Royal Irish Fusiliers. Averell, like most of the men, was transferred on 20 September. He was issued a new regimental number (41534) and posted to C Company. Averell probably saw action with the 9th Battalion during the Battle of Cambrai in November and December 1917. On 28 December 1917 Averell, together with a large number of men from the battalion, transferred to the Tank Corps (No.304872) and was posted for training to the Tank Corps Depot at Bovington, Dorset. On 8 July he returned to France and was posted to the 15th Battalion, C Company. Averell's tank battalion was involved in the fighting on several occasions during the Advance to Victory offensive, including on 8 and 9 August (Amiens), 21 August (Albert), and 30 and 31 August (Bapaume). On 3 September he badly sprained his ankle while playing football (a report finding that the injury was not his fault). He was evacuated to England where he was treated at the South African Hospital, Richmond Park, London, before being posted to a reserve unit at Swanage. He returned to France on 30 October 1918. Averell was transferred to Class Z, Army Reserve, on 21 February 1919. Image sourced from Nick Metcalfe's Blacker's Boys.